One way in which you can massively upgrade performance is to replace your standard engine with another, better engine. This has the potential to give you improved power, better economy and factory reliability without costing a great deal. Unfortunately, it can in some cases also lead to a situation where you end up paying two or even three times as much money as you expected, and have an unsafe - and even illegal - car. Engine swaps can be categorised into different levels of difficulty (and levels of expense!). Some can be straightforward, others can require major custom engineering. An engine swap can be relatively simple if your car is already available in the country where you live with a more powerful engine installed. However, you need to be quite sure of your facts. Perhaps someone has told you that you could also get your six cylinder car with a factory V8 - but maybe the V8 car was actually the model before the one you own, not the same model at all. That little point could be enough to make the swap much more expensive. For example, if the transmission tunnel in a RWD car was made smaller as models went on, fitting that large engine (and its large gearbox) could mean that the apparently simple engine change actually requires a whole new transmission tunnel or the use of a weaker, smaller gearbox. In front-wheel drive cars, the subframe (off which the front suspension also often hangs) can change from model to model; if you have to source a whole new front end to go with the "factory upgrade" engine it may not be as cost-effective a swap as it first looks. But some cars have had such a wide variety of engines fitted by the manufacturer that easy upgrades are possible. For example, Commodores and Falcons have been available with a range of engines over the years. So if you have a VP Commodore V6 and would like to install the V8 that was also available in the VP, everything that you need can be bought from wreckers (or from Holden, in the case of rare parts). Many workshops will be familiar with this type of engine change, and workshop manuals will also be available showing exactly how the more powerful engine went into the car. However, before doing this sort of factory upgrade swap, make sure that you know which other things (besides the engine) were also changed by the manufacturer. These changes could have included the radiator, the front springs, the front brakes, engine mounts, the transmission, the fuel pump, and so on. You can be sure that any of the parts that were upgraded by the manufacturer were improved for a damn good reason, and following in the manufacturer's footsteps gives you the benefit of their engineering. When engines were changed in capacity but were otherwise externally identical (eg the 2.4, 2.6 and 2.8 litre Nissan L-series sixes) another easy swap can be carried out. Some manufacturers improve their base engine substantially by building a turbo (or less often, a supercharged) version of the same engine. Where the base engine is installed as standard in your car, you will probably be able to install the turbo version in its place. The blocks will most likely be externally identical - making engine mounts and gearbox bellhousing patterns the same - and ancillaries like power steering pumps and the air con will be easy to change over from one engine to the other. However, a turbo engine will be a physically different shape at head level, with the new turbo, a new exhaust manifold, turbo plumbing and possibly a different inlet manifold and plenum all used. Some turbo engines are much wider than their naturally aspirated sisters; don't always assume that the turbo engine will fall straight into place, just because the base engine is already under the bonnet. If the manufacturer fits the turbo engine into your model of car in another market, you can be sure that you will be able to do the same. However, if that turbo version of the car isn't sold here then there may be important parts that are required in the conversion that you may have difficulty in getting. For example, in a FWD tranverse engined car, perhaps the turbo engine requires a differently shaped engine mount to clear the turbo. Or, perhaps the turbo versions have a different brake booster fitted, one designed to clear the different intake plenum chamber. Most of these problems can be overcome - but the extra expense and/or work needs to be budgeted for. If you are prepared to go the extra mile (perhaps many extra miles), you can install into your car an engine completely foreign to it. It needn't even be from the same manufacturer, and it needn't even by of the same type. For example, if you have a Mazda MX5, you can put a Lexus V8 into it - it's been done. Or a V8 into the back of a Porsche 911, or a turbo rotary into a Morris Minor Ute. However, since this series is about budget performance - getting the most from the least amount of cash - there's not a lot of point in discussing this one much further. Such conversions are very often hugely expensive - sometimes as much as an extra $5000 or $8000 over the cost of the engine and its management system. When you consider that a workshop doing this sort of mega-swap has to custom make a huge number of bits and pieces - perhaps even the driveshafts - the reason for the high price becomes clear. This sort of swap should not be attempted at home unless you have enormous experience in this type of thing - and then you probably wouldn't be reading this story anyway! You often see people asking questions on Web discussion groups are mega engine swaps. However, much more often that not, they are stunned and disappointed when a realistic cost for this type of swap is mentioned. Of course, if you are patient and skilled, anything's possible - but it might well take a few years of part-time work to do a swap of this type. By far the most cost-effective way of running the new engine is to use the new engine's standard management system. If you're on a budget, trying to bodge up the old system to run the new engine, or automatically buying a new programmable management system, are both approaches that are less than ideal. the form of a half cut (the complete engine bay with all mechanicals and electronics in place). Buying a bare engine and then purchasing a programmable ECU to run it is false economy, unless you intend going the full hog in engine modifications. For example, if it's a turbo engine and you're just going to wind the boost up a little and fit a good exhaust and intake, it's crazy spending the money on a programmable ECU when a far better system - the factory ECU - is available for perhaps only a few hundred dollars extra over the cost of the engine. I've lost count over the years of the number of unhappy people I have met who have bought a bare Jap-import engine for peanuts (good), and then bought a cheap programmable ECU to run it (often bad). By the time the inferior ECU is mapped on the dyno, the buyer will often be $1500 behind where they would have been, had they simply bought the factory system. Be very wary of workshops that tell you that the factory management system is poor - they may simply not know how to wire the factory system up and be looking for the easy out, helped along by the profit that they will make on the sale to you of a new management system. However, if you are buying an engine with loom and ECU, make sure that the loom is complete. It is just a recipe for disaster to buy a loom and find that the raggedly cut off wires stop a few centimetres away from where the ECU plug should be. If the loom is complete, the system should be able to be installed into the new car without too many problems. Wiring diagrams are available now for every Japanese import engine, and if that diagram costs $40-$50, it's still damn cheap at that price. Purchasing the new engine in the form of a half-cut is best of all. Not only do you get the engine, complete loom and its ECU, you also get every sensor (including often missing sensors like firewall-mounted MAP sensors and the speed sensor), the front brakes, and so on. In short, you get everything that you will need to upgrade the engine half of your car to the factory higher performance specs. You can also label the complete wiring harness before disconnecting it, and even start the engine and run it before you pull it out. In our opinion, if a half-cut costs (say) 2.5 - 3 times the price of a bare engine, it's worth it. It's very easy to fall into the trap of visiting a wrecker, looking at a bare engine (complete with gearbox), seeing the price, and getting very excited. But you need to multiply its price by probably 4 - 6 times by the time it's installed by someone else in your car and is running well. So, an $800 bare engine will typically cost $3000 - $5000 to be bolted in, have a cheap programmable management system put on it, and be ready to drive away. Some workshops will charge substantially more than this. Why? Well, did you remember the intercooler core and the bigger fuel pump that you will need? Did you realise that new engine mounts will need to be made, and that the exhaust will need to be adapted to the new engine? Did you take into account that the new management system costs $1500? ...and so on and so on. If you buy an engine complete with a good factory loom and ECU, it will probably cost about 2 - 2.5 times the initial purchase price to have it running in your car. In other words, that $1300 engine will cost $2500 - $3500 all up. A half cut conversion might cost you twice the initial price to get into the car - but remember that you also get the better front brakes, every component under the bonnet, and so on. In short, the cheaper the engine, the greater the amount you need to mentally multiply its purchase price by - there's no such thing as a free lunch. If you want to keep costs down as low as possible, buy a half cut and do all of the work yourself. Because you already have a complete, working model in front of you, it's far, far easier than taking other routes. You will also end up with the best upgrade of all. If your engine upgrade needs to be legal, do all of the investigations about this before you spend a cent! Over the years we've met more than a few people who have cars that they cannot use on the road - they're unregistrable, and there's nothing now that they can do about it. 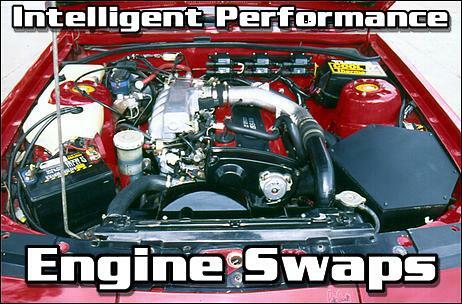 You want good engine swap at the lowest cost? If legality is a concern check this aspect out first. Find out what other more powerful engines the manufacturer offered in your car. If there is a simple, manufacturer-authorised swap, do it. Find out whether there was a turbo or supercharged version of your car's engine built by the manufacturer. If there is one that will bolt straight in, do it! When buying a new engine, purchase its standard management system and gearbox at the same time. Be aware that the installed costs of the new engine will be as much as six times the cost of the engine itself. A half-cut makes for a relatively simple and complete upgrade.